mood: glad to be home and warm! Well, fooey, part of my post went away! Anyway, we had a nice little slow-motion adventure the other day when J. decided I needed a nature fix. 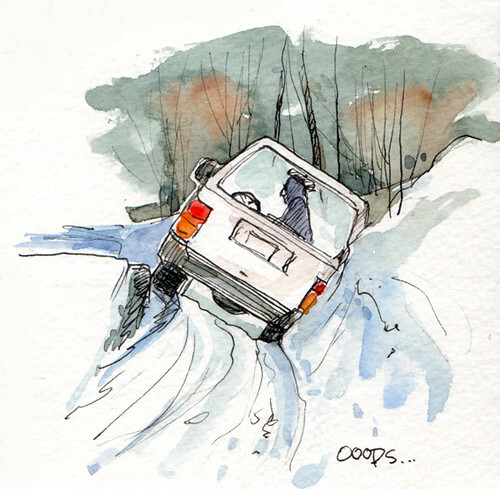 The road was slick, the drop-off was extreme and the ditch was deep! I had to duck-walk up the seats to get out the driver's side! YAY!! the sitzmark jeep! or is it a "leanmark?? so glad you guys are okay, and that the jeep didn't take a major hit from this! Hope all is well! Congratulations on Your New Book! Thank you, Sherrie! It's exciting! So glad no one was hurt!! Other than that, I'm glad it turned out okay!